Kickin’ it old school with summer frosties. 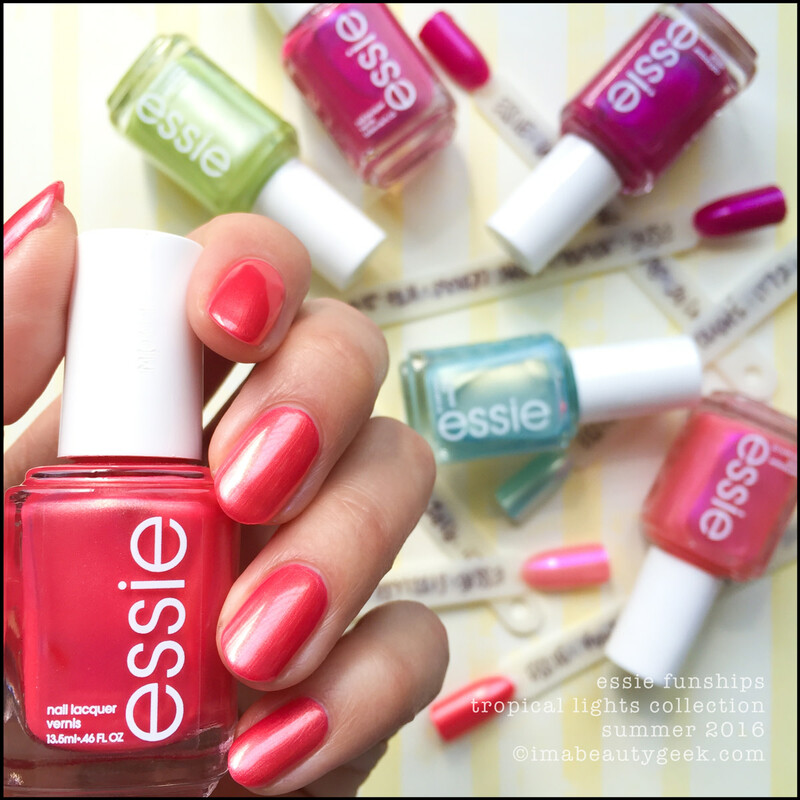 The Essie Tropical Lights 2016 collection started popping up on Essie Canada’s Instagram feed a couple of weeks ago and since then, I’ve been hitting up every Shoppers Drug Mart in my hood hoping to get lucky. Last night after work, in the freezing cold, windy Springter night, I wandered up the street to my other local SDM and totally scored! 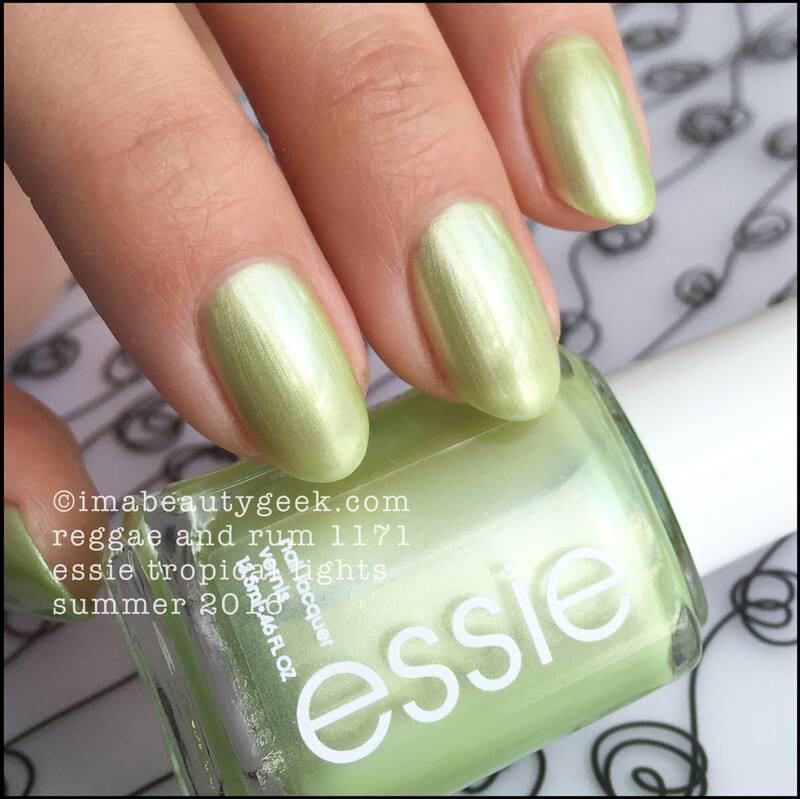 Essie Reggae and Rum 1171 – Essie Tropical Lights Collection 2016 (above). 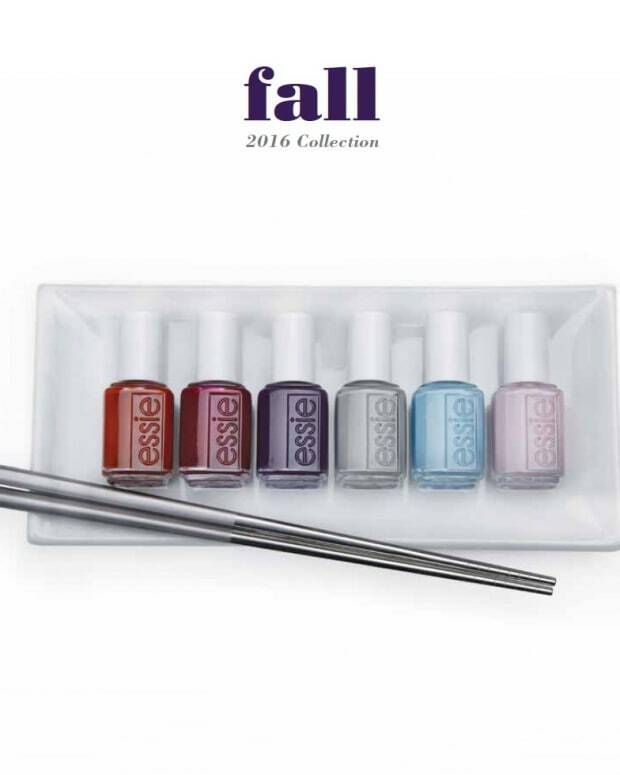 If you’re not so great working with frosts, you’re not going to love this shade. Me? Decades ago, I cut my teeth on shades like these. When I see a bottle of frost, I’m all “Yeah! Challenge Accepted!” I might be somewhat of a freak, but it’s fun for me to try and get the stuff on evenly, as streak-free, and as opaque as possible in as few coats as possible. That meant three coats with Reggae and Rum - three with slight VNL and no top coat. Dude, this icy celery green is SO old school! I heart it. 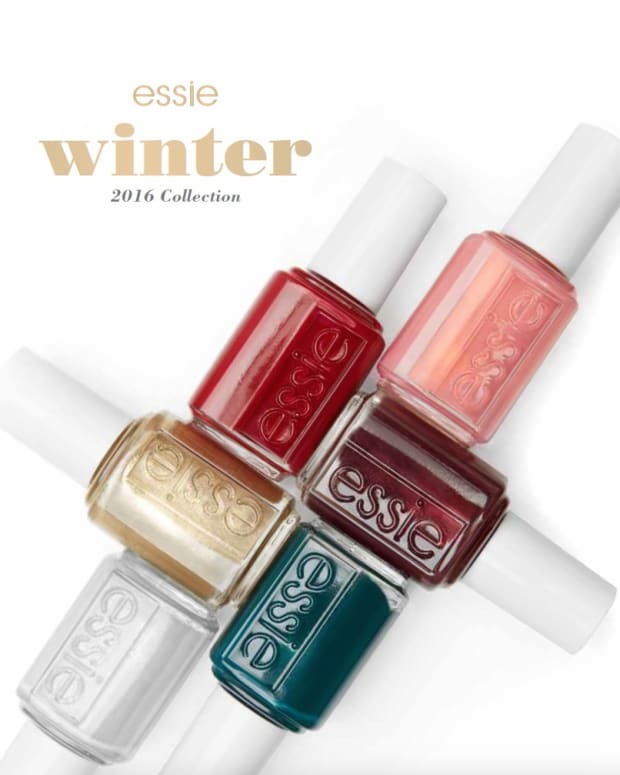 Essie Classical Cliché 1172 – Essie Tropical Lights Collection 2016 (above). Squeee! More shimmertastical frostyness! The key with this stuff is quick purposeful strokes from cuticle to tip. Get full, streaktastical ugly coverage with your first coat and go from there. You really have to commit to the stroke or you’ll end up with mega-streaks. You’ll also want to do two coats and give it a couple minutes to set up before heading back in to do your third coat. Yes, slight visible nail lines and to get rid of those, simply head to your Archives, pull out a similar shade of pale blue, and use it as a base coat. That’ll get it to opaque much faster and have the added benefit of cutting down on overall coats. Smart, huh? 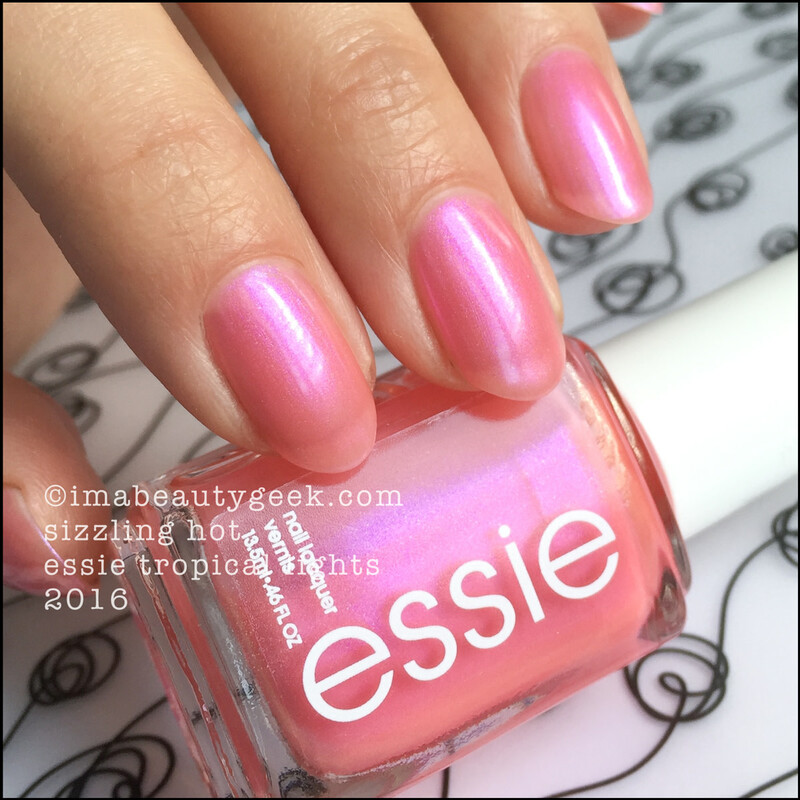 Essie Sizzling Hot 1173 – Essie Tropical Lights Collection 2016 (above). Hmm… I feel like I’ve just seen this somewhere.. Oh, right. 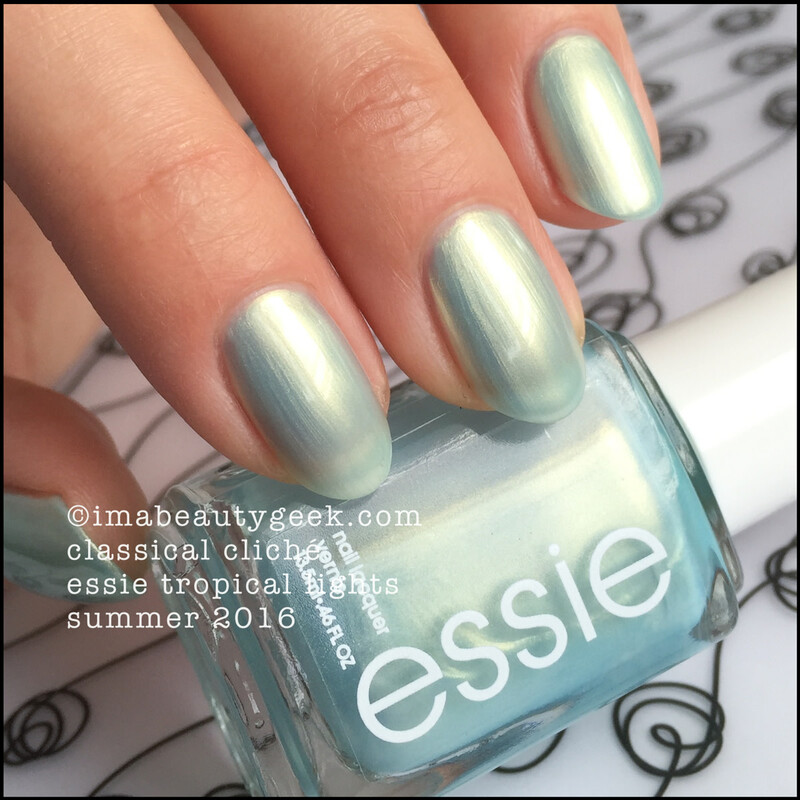 Essie Retro Revival has a similar colour in it – Bikini With a Martini. Here I’ve done three coats and it’s still sheer. I’m not going to show you what to do with this bottle but I will direct you to my Retro Revival post. If you wander around in there, you’ll see what kind of things you can do with a shade like Sizzling Hot. 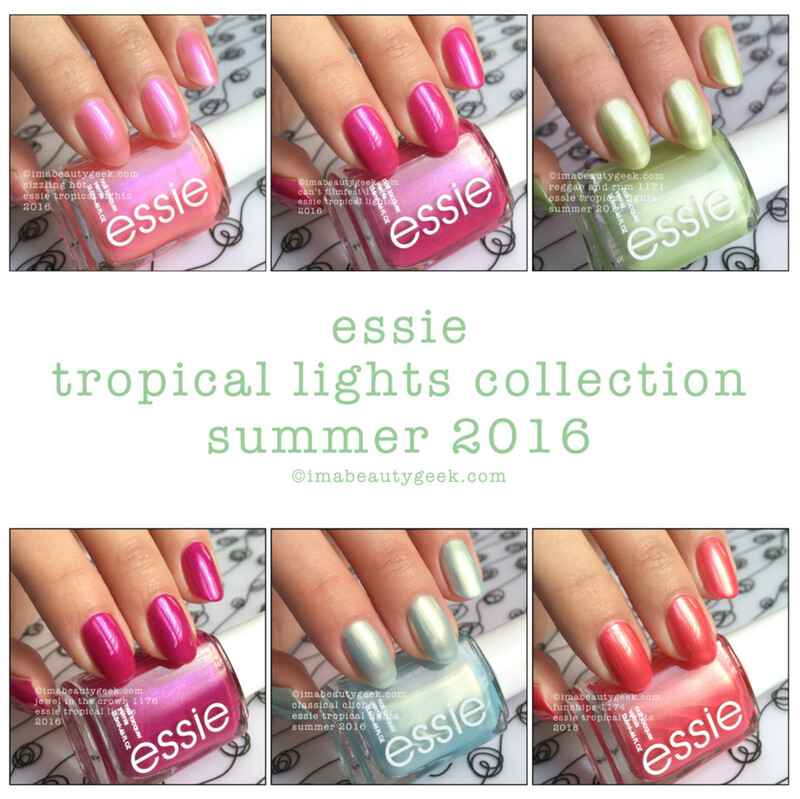 Essie Funships 1174 – Essie Tropical Lights Collection 2016 (above). Wowza! How’s that for a frosty coral-leaning red! You might be able to get away with a single coat with this splendid formula but I did two for maximum saturation. You’re going to love this one. If you see it, buy it. Don’t even hesitate. 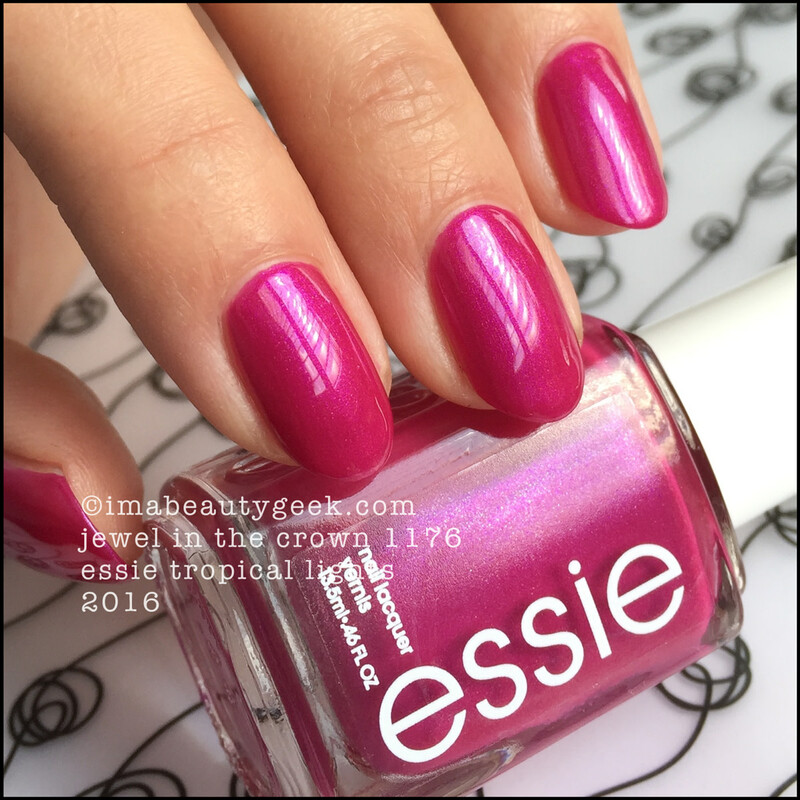 When you get it home, remember I said use quick, sure strokes and polish like you know exactly what you&apos;re doing - even if you don&apos;t.
Essie Jewel in the Crown 1176 – Essie Tropical Lights Collection 2016 (above). Again, I would fight you for this shade if you had the last one in your hand and I had none. Can’t help it. It’s like crack for me. It’s not so much a frost as a pearly shimmer that almost reads as metallic. Brushstrokes are non-existent and if you wanted to OCW it, you could. Me? I did two for maximum depth of colour. So there you are! 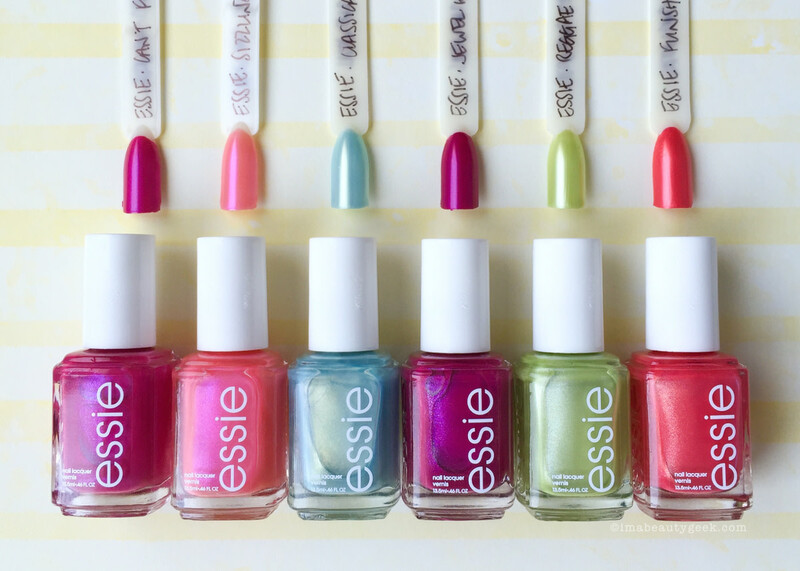 It’s the mysterious Essie Tropical Lights collection that almost eluded me. 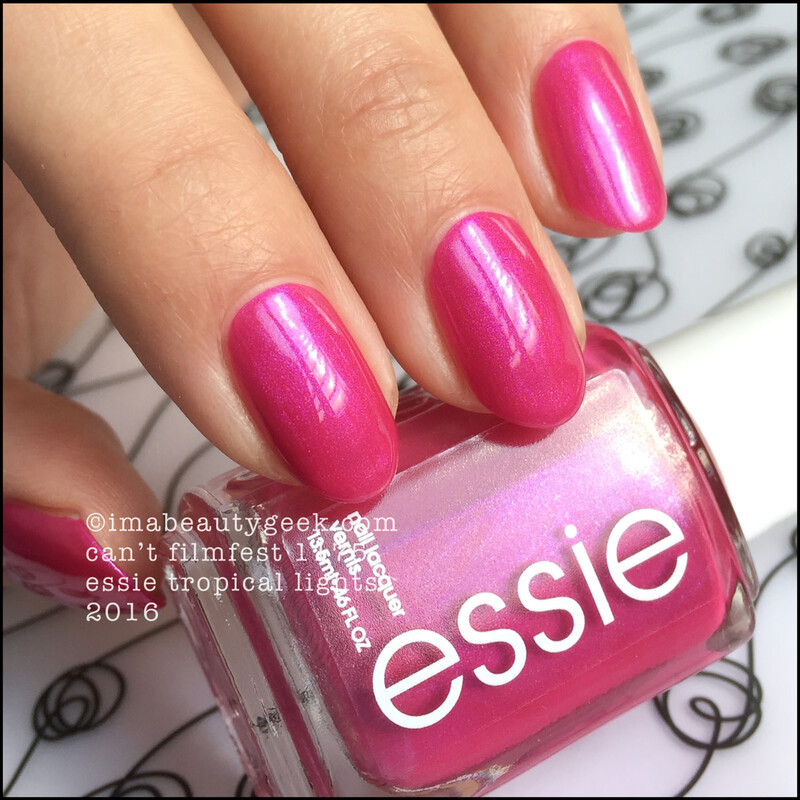 I have heard (from Instagram pal @curlycomedynailart) about a couple of these shades being re-issues but I don’t have any of them so they’re all new to me. I’ve also heard the B-word associated with this collection... Bubbles. As you can see, I had zero issues with the B-word (on my sticks or on my nails) but then again, I rarely do. Availability: I got mine from a North York Shoppers on Yonge Street. My sales girl (Irene - Hi Irene!) was so excited I bought all six she asked me for my Instagram so she could see them once I posted. They were on sale at $9.99 each. Word is you can also find them at other select Shoppers Drug Mart, Walmart, and Target stores all over the place. Good luck in your quest - these are limited editions so when they&apos;re gone, they&apos;re gone. Oh! 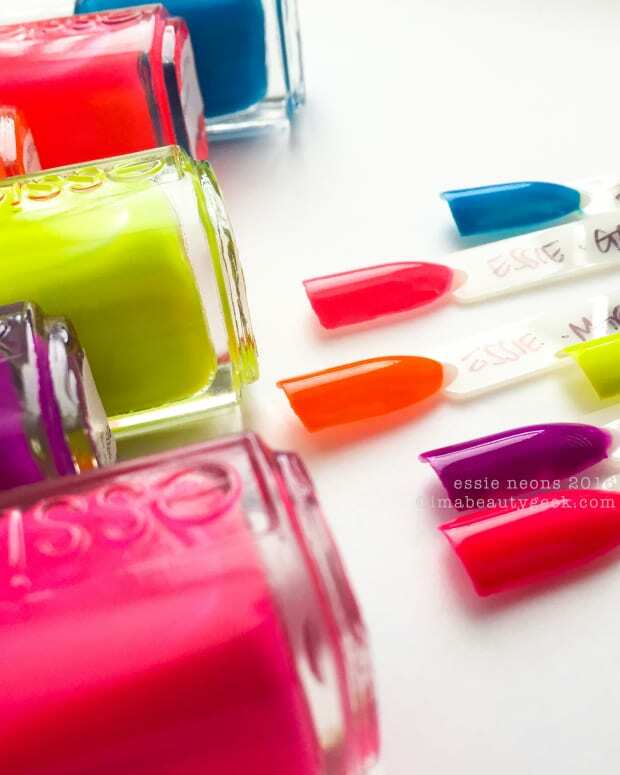 And if you haven&apos;t heard yet, Essie is releasing a new line called Essie Gel Couture - it&apos;s not gel, it&apos;s polish. And where&apos;s the only place on the whole interwebz you can find swatches of all 42 brand new shades? 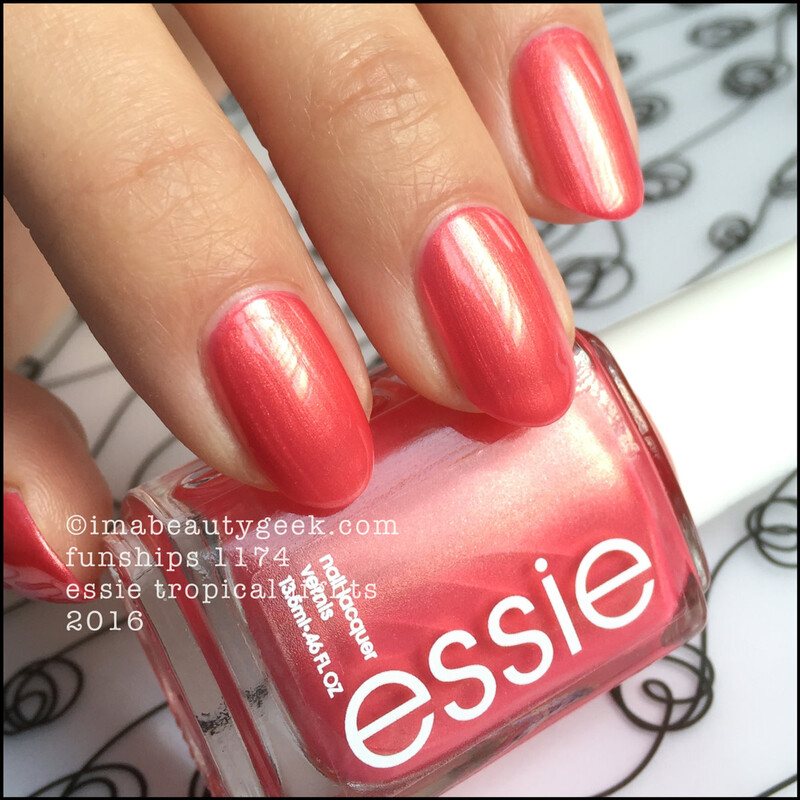 Well that would be here in our Essie Gel Couture Swatch & Review post. See ya&apos;ll soon! Manicures & Photographs Karen Falcon (she really did have chicken wings for breakfast yesterday).